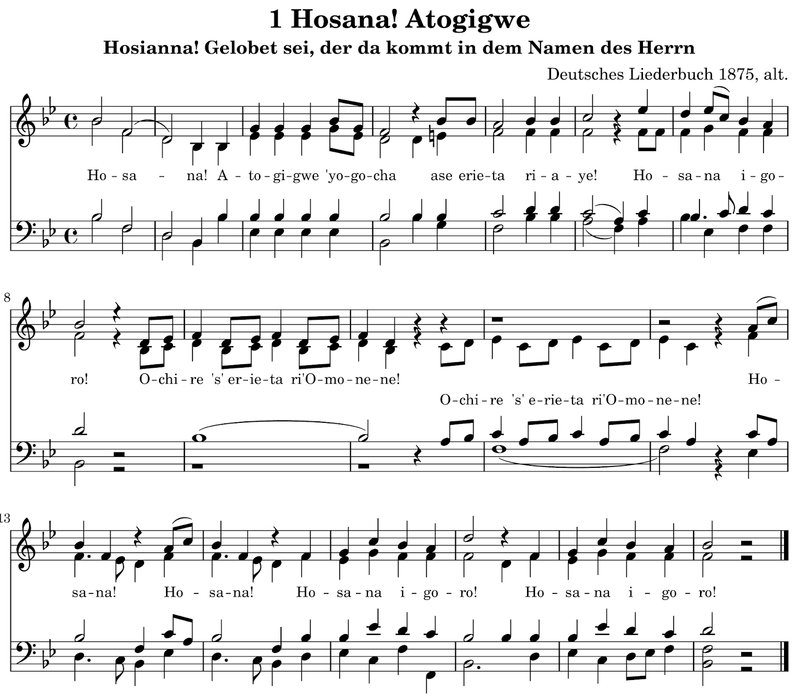 Some music from Hymnary dot org and other sources to help with learning hymns in Moterere Omonene. OMOROBERIO BW'AMATERA AYARE IME Y'EGETABU EKE. so ist dir's die liebes Gabe. in dem Kreuzes ofen sein. ihn zu opfern vor dir lieben. 57 Ning'o 're Omosani One? Moterere Omonene "Let Us Praise the Lord" is a Confessional Lutheran hymnal in the language called Ekegusii. It was published in 2008 through the Lutheran Heritage Foundation in coordination with Kiarurwe na Ekanisa y'Ekeinchili Ekelutheri Kenya (Evangelical Lutheran Church of Kenya). The Lutheran Heritage edition is from 2010. It was typeset and printed by Printwell Industries, Ltd. Nairobi, Kenya. 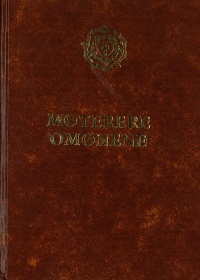 Moterere Omonene consists of 347 hymns. This volume has Sunday liturgies, orders of service for weddings, funerals, confirmations, baptisms, various dedications, the propers for each Sunday, and Luther’s Small Catechism. 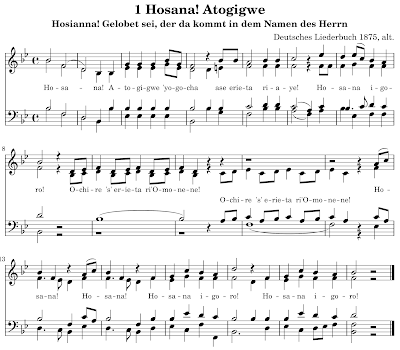 It is a very good beginning for an Ekegusii language Lutheran hymnal. But there are several points at which it could bear improvement. 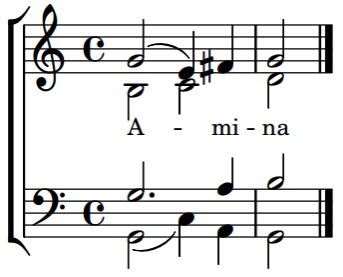 It contains no musical notation for either the Liturgical settings or the hymns. There are frequent typographical errors. In some cases the translation choices in hymns are worth improving. An additional aim of this project is to help English speaking Lutherans in America to grow in appreciation of the common heritage they share with their Confessional Lutheran brothers and sisters in Kenya of the Abagusii people. 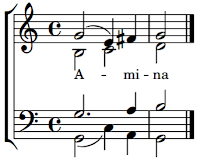 The information about the hymns, authors, composers, etc. in Moterere Omonene is sometimes misspelled, incorrectly typeset, or sometimes just in error. As I work through the hymns I will try to make the information uniform in presentation and content. I will be looking for organists to record some settings for the church in Kenya to use in training pastors and congregations. 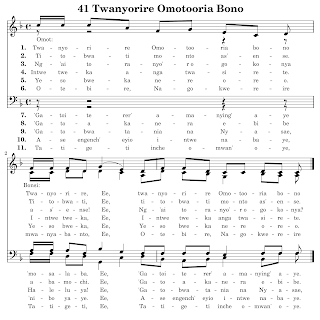 I also hope to work with LHF to put Moterere Omonene on the Hymnary.org website. 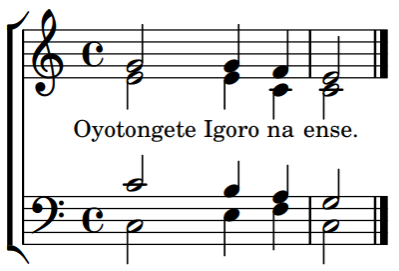 Ogotera: Ebuku ya Isaya 6:3, Okomaanoka 4:8, na Matayo 21:9. [Igoro na] Ense yaichoirwe n’Obonene bwao. 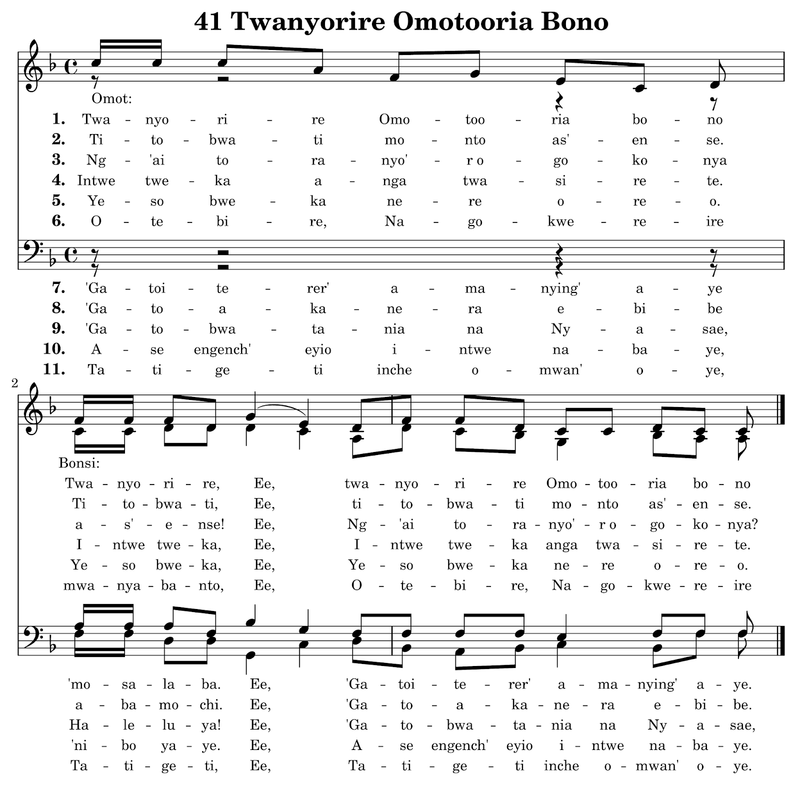 Ogotera 41 "Twanyorire Omotooria Bono"
Ekegusii Notation Setting: Moterere Omonene #41 "Twanyorire Omotooria Bono"
Ase engench' eyio intwe nabaye. Ekegusii Notation Setting: Moterere Omonene #1 "Hosana! Atogigwe"
Atogigwe 'yogocha ase erieta riaye! [Alle] Hosianna in der Höh! [Einzelne Stimme] Der da kommt in dem Namen des Herrn! [Alle] Der da kommt in dem Namen des Herrn! [Eine Stimme] Hosianna in der Höh! Omonene Nyasae oito nao are aiga, nao are amo naintwe. Tomosasime, tomosike, naende tomoigwere buna agotworokereria ase Ring’ana riaye. Mwanche Omonene Nyasae oo nenkoro yao yonsi, na omoyo oo bwonsi, ne chinguru chiao chionsi, na obong’aini bwao bwonsi, na omoamate oo buna bweanchete. Ninche Omonene Nyasae oo, toba nechinyasae chinde otatiga inche. Toriatora bosa erieta ri’Omonene Nyasae oo, ekiagera Omonene tagotiga komoa egesusuro oyokoriatora erieta riaye bosa. Rinyore rituko ri’Omonene, orichene. Basike iso na nyoko. Toita, totomana. Toiba. Tomoriera omoamate oo oborimo. Tobasia kogania enyomba y’omoamate oo. Tobaisa kogania omokungu bw’omoamate oo gose omosomba oye, gose eng’ombe yaye gose kende gionsi are nakio. Abanchwa ase Omonene, toigore chinkoro chiaito, tomweiterie Nyasae ebibe biaito. Nyasae, Omobui o bionsi, Tata bw’amabera, inche inde omotaka naende otari na nguru na oiboretwe ase chingencho chi’ebibe, neitirie ase obosio bwao ebibe biane bionsi, ebio nakorire ase ebirengererio na ase amang’ana na ase ogokora. Nakogechirie ara aange. Nagweneire ara aange. Nagweneire egesusuro kiao aiga ase ense nonya ngoika kare na kare. Korende nechandire ase ebibe biane na kobiorokia ase ekeene. Nagosoroire ase amabera ao amanene onyabere na gontooria inche inde omotaka na omonyene ebibe. Aye Omonene, onyabere ebibe biane bionsi, ong’e chinguru chi’Omoika oo Omochenu, ntware obogima oboyia. Amina. Nyasae Omobui, Tata o Igoro, ngweitia inde ng’a nagokoreire ebibe aye nabaamate bane, ase ebirengererio ase amang’ana, na ase ogokora. Nagosoroire onyabere. Ase engencho yaye Yeso Kristo onyabere ebibe biane bionsi. Onchene n’Omoika oo Omochenu. Otoererie ebirengererio biane na ombuere kobaabera abaamate bane, erio inyare kogokorera aye ase oboyia bw’obogima, ase obonene bw’erieta riao richenu. Amina. Nyasae, omonyene chinguru chionsi, namabera, otwabeire, akamorwa Omwana oye omomoima atokwere ase omosalaba. Ase engencho yaye obaabeire ebibe biaino bionsi. Amina. Ogwitia oko gakorabe ogw’ekeene naende imoganetie ase chinkoro chiaino chionsi okwaberwa kw’ebibe ase enchengo ya Yeso Kristo; bono ase chinguru chie Ring’ana riaye na ogochika kw’Omonene oito Yeso Kristo nkobarareria inde ng’a: Nyasae ase obuya bwaye obaabeire ebibe biaino bionsi; ase erieta ria Tata, neri’Omwana, ☩ neri’Omoika Omochenu. Amina. This presentation discusses the meaning of the Hebrew word הָעַלְמָ֗ה Ha`Almah The Virgin Omoiseke omwekungi and how this word is used in the Hebrew Bible and understood in the Greek New Testament. Learning the uses in the Hebrew Bible will enable us to correct misunderstandings and mistranslations which are widely promoted in academic and non-academic areas. It will also help us to correctly understand the use of the term הָעַלְמָ֗ה Ha`Almah in context for Ebiblia Ekegusi, whether the terms used are omwekungi, omoiseke, or omokungu oria. We will also look at the masculine form of the word הָעָֽלֶם omwana, lad, young man. In the presentation we will also give the Greek version (The Septuagint) for comparison. Several scholars have challenged the translation of the word הָעַלְמָ֗ה Ha`Almah as the Virgin. The basic assumption which these scholars share is a denial of miracles. They deny that God is able to do what He wills and has authority over the natural world—that He is Omnipotent. And they deny that God knows all things past, present, and future— that He is Omniscient. In Isaiah 7:14 their twofold denial means that 1) they deny that any Scripture could actually be predictive of the future. Particularly, they deny that this passage speaks specifically of the future birth of Jesus Christ. And 2) they deny the miracle of Christ’s Virgin birth. 31 Bamalaika Inchuo Korwa Igoro! I'm not sure which Schubert is meant. FA Schubert b1797-d1828. The note "from Riga 1706" is obscure. MO info: "Eriogi na ogotera: Mit den Hirten will Ich gehen. Gr. MH139 NK31 TB17 PB111 22 NK30 MB33, Omoroisia eriogi: A. Rische 1819-1906, Omoroisia amang'ana: E. Quandt 18351911"
Lecture for Lutheran Theological Seminary-Nyamira, Kenya. Part 3. This is the only mention of Sargon in the Bible. The capture of Ashdod probably took place in 711 BC, in Sargon II’s 10th or 11th year. Sargon II was the son of Tiglath-Pileser III. From what we can find it looks like he usurped the throne from his brother Shalmaneser V. His son, the crown prince, Sennacherib, pictured in the carving, assisted in ruling. Omogati oyo tokonyora nokobwatana nomobere o Kristo. Omogati noyomo, intwe tore abange igo tore omobere oyomo. Naki intwe twensi nigo tokonyora ensemo y’omogati oria oyomo. Ase erieta ria Nyasae Tata, neri’Omwana, neri’Omoika Omochenu.